We’ve got lots to show! 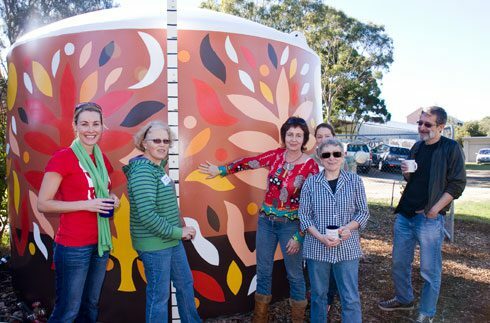 Now THIS is a rainwater tank… and a work of community garden art. The artists with their work. Randwick Community Organic Garden will give us a brief outline of their Committee and operating structure, a tour of the garden, our Permaculture principles and layout, solar and battery system, chooks, biopod, a range of composting systems, water storage and distribution and aquaculture. We also would like to talk about plans for a National Gathering in Sydney next October and set up an organising group. Tell all your community garden friends to come along! Directions: We are located at the NORTHERN end of the reserve off BOTANY street and opposite MEEKS street. Rainbow st runs along the southern border. Keep your eyes peeled for the entry gate at the end of the park and drive in. a Greek orthodox church about 200m out on the left. Turn left at Dacyville lights, into the big Kingsford roundabout, straight through to rainbow street, up the hill, past Amber tiles, past three streets on the left and turn left at the park, right at the end of the park opposite Meeks st. Coming down ANZAC Parade, just stay on it till you hit the big roundabout in Kingsford, turn left and follow the directions above past Amber tiles. 11:00am Tour of Randwick Community Garden Community GardenCommunity gardens—tell us your story, what have you been up to? plate and cutlery for yourself. Would love to have been there especially after being at the last one, unfortunately i am on leave, would love some feedback on letters of understanding/lease arrangements between gardens and councils as this is something we have to look at, if anyone has any docs. they can help me with and wouldnt mind sharing can you email me links,can i also extend a welcoming hand if you are looking for a venue for the next gathering Camden would love to have some visitors.